Northern Gaza Strip: Israeli warplanes carried out 15 airstrikes, launching 25 missiles to target a residential house that was completely destroyed, border control checkpoints belonging to the Palestinian armed groups and agricultural lands. As a result, a Palestinian civilian namely Khaled Ahmed al-Sultan (26), a farmer, was killed and his body turned into pieces in an agricultural land, while a Palestinian child was moderately wounded. Moreover, 2 members of the Palestinian armed groups were killed and 4 others were wounded. Gaza City: Israeli warplanes carried out 15 airstrikes, launching 57 missiles to target 3 residential houses, al-Rahmah Building comprised of offices for rent, al-Yazji resindeital Building comprised of 5 floors, al-Aqsa Channel Building, and al-Amal Hotel which had become the Internal Security’s office that was only few meters away from the former head office of the Palestinian Center for Human Rights (PCHR). 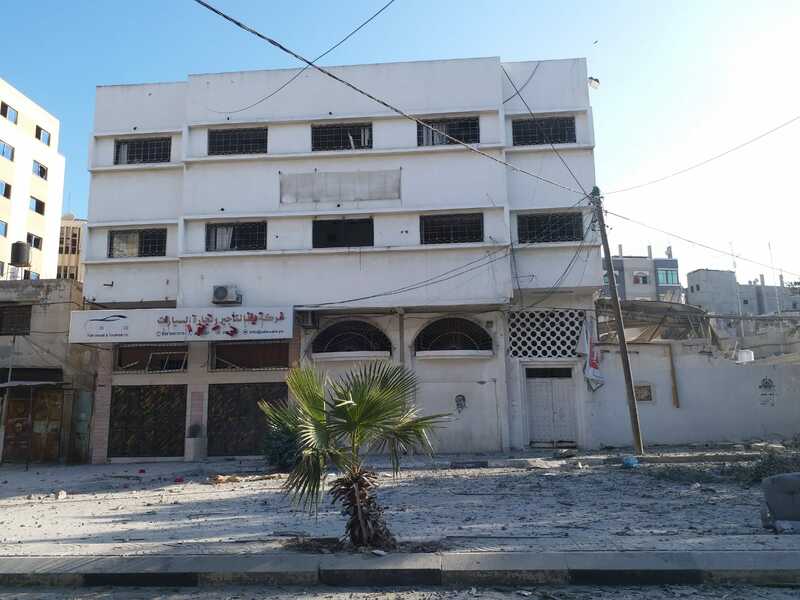 All the targeted buildings were completely destroyed while the nearby houses and buildings sustained severe damage, including PCHR’s former head office and al-Mizan Center for Human Rights where the windows were broken and the shrapnel hit the furniture and offices. The airstrikes also resulted in the killing of a Palestinian civilian, namely Mos’ab Sa’id As’ad Hawas (21), and injury of 15 Palestinian civilians, including 3 women and 2 children. Moreover, the airstrikes targeted many sites belonging to the armed groups and Ansar Complex. Central Gaza Strip: Israeli warplanes carried out 8 airstrikes, launching 14 missiles to target a Palestinian police checkpoint and several sites belonging to the armed groups. As a result, 3 civilians, including a woman and a child. 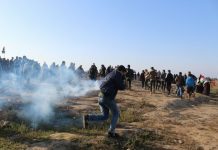 Moreover, the Israeli forces fired 7 artillery shells at many agricultural areas adjacent to the border fence with Israel. Khan Younis: Israeli warplanes carried out 21 airstrikes, launching 38 missiles to target 2 residential houses; including one that was completely destroyed, and many sites belonging to the armed groups. No casualties were reported but many Palestinian civilians panicked. Rafah City: Israeli warplanes carried out 11 airstrikes, launching 17 missiles to target 2 residential houses, agricultural lands and military sites belonging to the armed groups, completely destroying all of them. As a result, 2 civilians were wounded, including a child. Moreover, 2 members of the armed groups were killed while 2 others were wounded. Calls upon the international community to immediately take action to stop the Israeli crimes and reiterates it calls upon the High Contracting he High Contracting Parties to the 1949 Fourth Geneva Convention to fulfill their obligations under Article 1; i.e., to respect and ensure respect for the Convention in all circumstances and their obligations under Article 146 to prosecute persons alleged to commit grave breaches of the Fourth Geneva Convention, noting that these violations constitute war crimes according to Article 147 of the same Convention and Protocol (I) Additional to the Geneva Conventions regarding the guarantee of Palestinian civilians’ right to protection in the occupied territories.